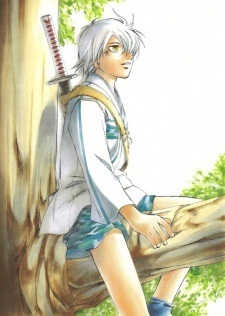 Sarutobi Sasuke is a young ninja who is one of three members of the Sanada Juuyuushi who appears prominently throughout Samurai Deeper Kyo. He is only 12 years old, but even though he is young, he is very great at handling a sword. Originally, he lived in Aokigahara (a forest filled with the failed constructs of the Mibu) with his friend Kotarou (now Makora of the Juunishinshou). Being of the Forest, he has heightened strength and abilities as well as characteristic golden eyes. Sasuke was involved in most of Yukimura's plots, but was ultimately left out of Yukimura's deception of the Mibu clan as Yukimura needed even Sasuke to believe he'd betrayed his friends in order for the Mibu to believe it as well. Sasuke originally wielded a Muramasa blade which was physically identical to Kyo's Tenrou (one of the four masterpieces that Muramasa forged), but when that sword was cracked in a duel with Demon Eyes Kyo (a fight to determine who had the real Tenrou) he was given the Shibien - the oldest of Muramasa's Four Masterpieces. The Shibien blade, however, is exceptionally bloodthirsty and its creator, Muramasa, had to have it bound in chains to prevent it from turning on anyone. Strangely enough, it serves Sasuke obediently. Sasuke seems to have control over Lightning techniques. Sasuke possesses a technique called Raikoken that electrifies his sword. Thunder Fire calls a bolt of lightning down to strike an enemy. Thunder Flower Storm brings many lightning bolts down around Sasuke and his enemy. Thunder Net traps Sasuke's enemies in a web of lightning which never lets go. Thunder Tail connects Sasuke's lightning to his sword allowing him to kill an enemy with a physical strike. Sasuke's ultimate technique is Kirin which creates a lightning winged Pegasus that burns all it touches when it returns to heaven. Also, it was seen in several of Sasuke's battles that he has the same red eyes as Kyo.